Mekel MACH series microfilm scanners are high-performance production scanners for various types of microfilm. Ideal for service bureaus, corporations, government, archives, record managers and other organizations with large-volume microfilm scanning needs, Mekel MACH series microfilm scanners by Crowley provide exeptional level of accuracy, media flexibility and best possible quality. Powered by revolutionary Quantum scanning and processing software, these microfilm scanners offer superior image capture at full speed, sophisticated image processing features and significant savings benefits. 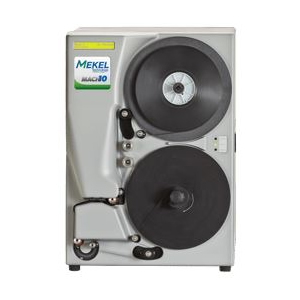 Download Mekel MACH Series Microfilm Scanner Specifications here. Mekel Technology is a Crowley company.